The horizontal carbonization furnace used in the PI membrane carbonization, carbonization of graphite, carbon materials products, and with the rapid cooling function. Complete sets of equipment from the power supply (power distribution cabinet, temperature control instrumentation, alarm systems, etc.) Transformer cabinet (transformer) furnace (furnace shell, heating element, internal support, loading crucible, insulation, insulation, etc.) (Japan conductive FP93, thermocouple, etc.) Vacuum system (pipeline, mechanical pump, breach valve, safety valve, vacuum gauge, etc.) filtration system (four filter). Temperature measurement and control system through the PLC and the host computer to seamlessly connect, real-time monitoring, control and display the operation of the entire set of equipment. Achieve power, furnace, cooling water, shielding gas, purification equipment, such as sequential control and chain protection, at the same time with early warning, alarm and other functions. High temperature furnace within 1600 ℃, can fully meet the sintering of various materials, carbonation and other treatment. With a new cooling system, the cooling time is reduced by 30% compared with ordinary resistance furnace. High-precision thermocouple partition temperature measurement, to ensure temperature accuracy. The use of digital display intelligent temperature control system, automatic temperature measurement and control process to complete the high-precision temperature, the system can be given a heating curve heating, and can store four of a total of 40 different process heating curve. Equipment has a measurement record, 10,000 times the data can be recorded, the data can be recalled through the historical curve. With USB interface, the recorded historical data can be saved to the U disk at any time. Internal circulation of pure water cooling system; digital water temperature monitoring system. Comprehensive PLC water, electricity, gas automatic control and protection system. Very good SCR overload, short circuit and false trigger, and overvoltage protection. The whole machine multi-channel data acquisition, and display and operation in the man-machine interface, the whole operating parameters at a glance, easy to operate. 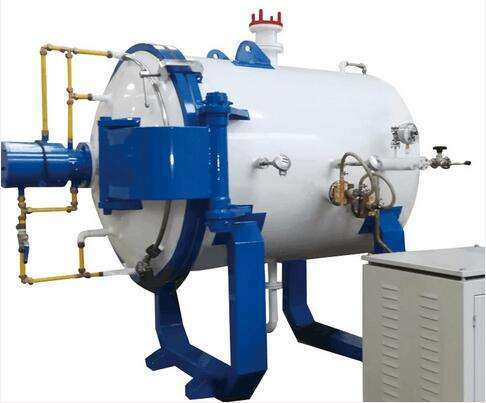 Furnace: double-layer water-cooled structure, can be negative pressure vacuum pumping; with vacuum pipe interface, an increase of vacuum damage valve, inflatable hole. Uniform temperature: Square cage graphite rod combination heating method, good temperature uniformity. Easy to operate: Furnace adopts horizontal, front and rear double doors, convenient loading and unloading, simple operation.